It’s that time of the year again: December. Time for some nice enjoyment with our loved ones. and maybe time for some nice after dinner liquors. Since I recently received a spot attachment for my studio strobes, this new goodie of course needed to be tested. So in extension to my Metallic still lives shoot which I did a while ago, I decided to do some more shoots with static subjects. In between the regular portrait shoots of course. I shot two bottles on a dark background and adjusted the color of the background light accordingly to match the color, or feel, of the bottle’s label. And beside that I made an image of the Liqor 43 Orichata Special on a white background. And this time the bottle is accompanied by a glass. For the bottles on the dark background I basically used two studio strobes with strip boxes and a strobe with standard reflector and color gel on the background. 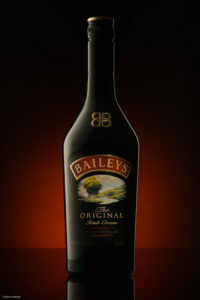 The background color for the Baileys bottle even is built from two different color gels stacked together in order to mix the colors and match the label’s color. Additional to the three basic lights, I used a strobe with the spot attachment to precisely light the labels of the bottles. 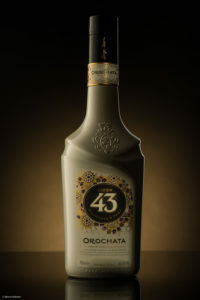 For the bottle of Liqor 43 Orochata on the white background I used a bit different setup to create the background. The background is is just a studio strobe with a softbox. The rest of the lighting gear is the same as the other two images.